9:47 not a lot of juice so far, but I like "riding the positive Moon flux"
9:28 assuming a new up Chaos Clamshell started late yesterday, I see a move 1, and now in a move 2. So a buy setup has a good chance of working out. 5/25/2012 10:15:20 AM MT sdg:: Stuck in the middle of a wedge pattern. 5/25/2012 10:03:51 AM MT Al****:: I haven't completely decided yet, but lately I've been thinking about it more - my main concern is that I not abandon my serious students, so there are lots of issues there. 5/25/2012 9:58:02 AM MT RIB****:: Al, so when are you going to fully retire? 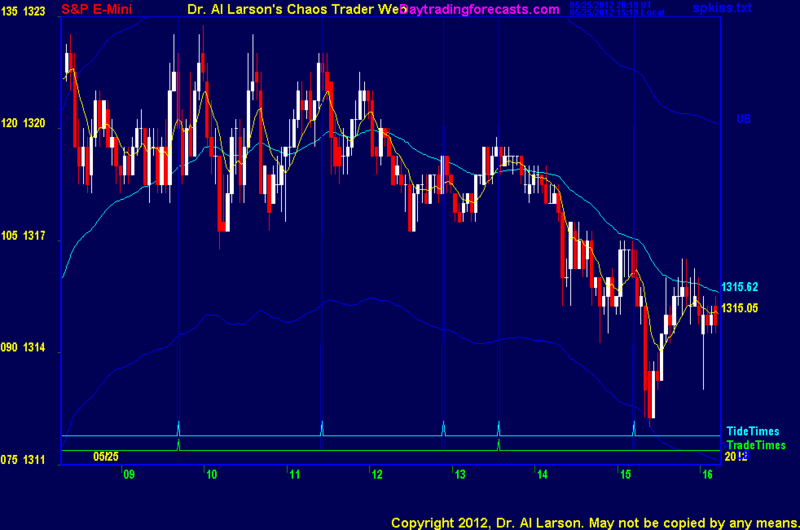 5/25/2012 9:22:23 AM MT EOE:: I use Ninja Trader. Which is free from my broker. 5/25/2012 9:19:23 AM MT WSL:: EOE, so, may I know whcih charting software will allow me to do so? Thanks. 5/25/2012 9:06:37 AM MT sdg:: Feels like a meat grinder so far. 5/25/2012 9:02:22 AM MT WSL:: AL, do not worry. Your 1328 target will come true. 5/25/2012 9:00:58 AM MT WSL:: Hi BBB. Thank you for your help. I am using ThinkorSwim real-time chart. I assume EXMA is Exponential Moving Average. How did you set bar count in ToS? Thanks. 5/25/2012 8:54:39 AM MT WSL:: Al said he was hallucinating....That was funny. 5/25/2012 8:13:56 AM MT WSL:: Newbie here. I am using 3-min bar. My 20-EMA is below 110-EMA, and my 110-EMA is pointing downward. It is different than Al's Chaos Clinic chart. May I know what did I do wrong here? Thanks. 5/25/2012 7:00:17 AM MT sdg:: GM all and good luck. Hope it's not a long weekend stinker. 5/25/2012 6:30:08 AM MT WSL:: Good morning all!